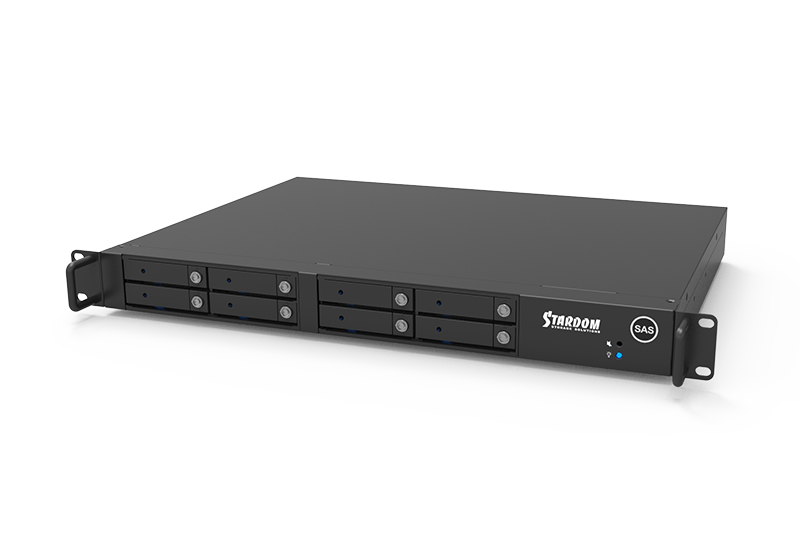 DT8M-U6 is compatible to most of 2.5" HDD/SSD product which are available in the market, you can use a RAID card for a more perfect storage solution. Its perfect structural design, optimized internal configuration, and enhanced internal hard disk protection with an aluminum alloy casing. This high durability is best suited for professional creative applications and mobile mobility applications. 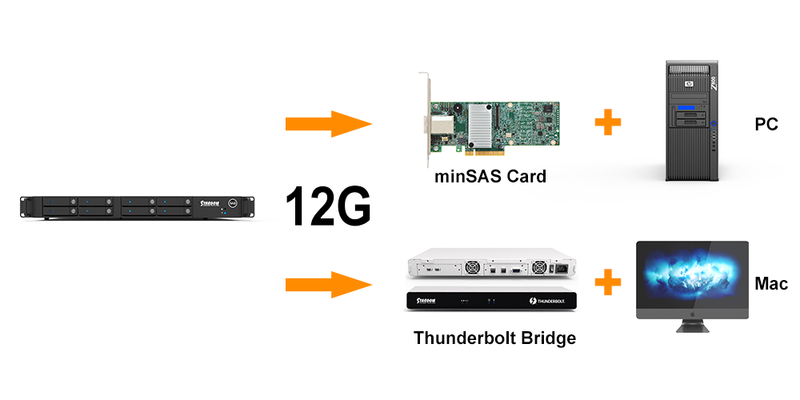 DT8M-U6's miniSAS interface supports 2 x SFF-8644 to SFF-8644 miniSAS cable which includes 8x12Gb/s bandwidths and lets each HDD/SSD gets a whole 12Gb/s bandwidths alone. 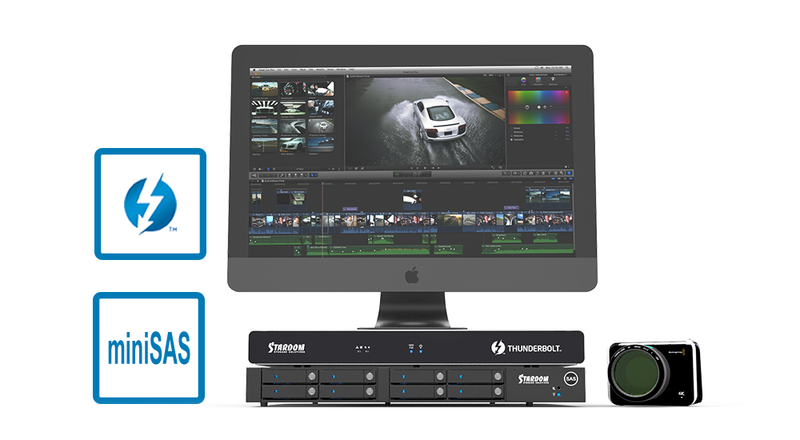 It brings you a best efficiency for data transfer for your heavy-duty video editing works! 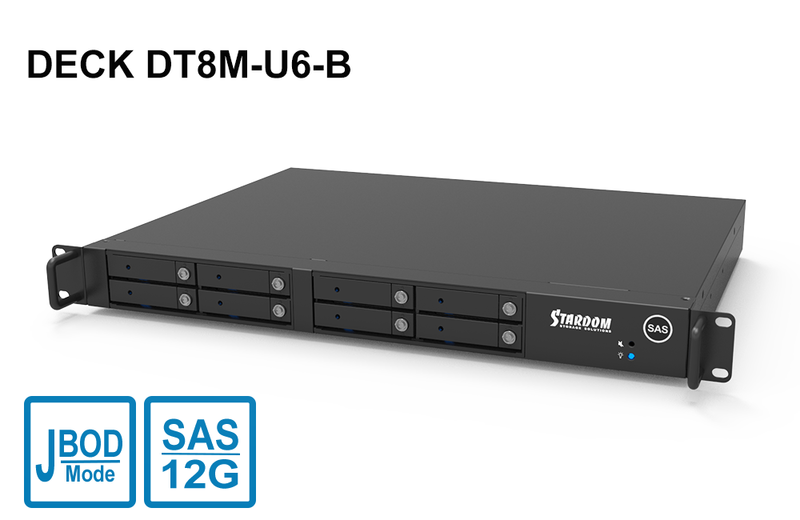 DT8M-U6 is also designed with the MCU feature which monitors and helps improving its in-chassis system temperature. 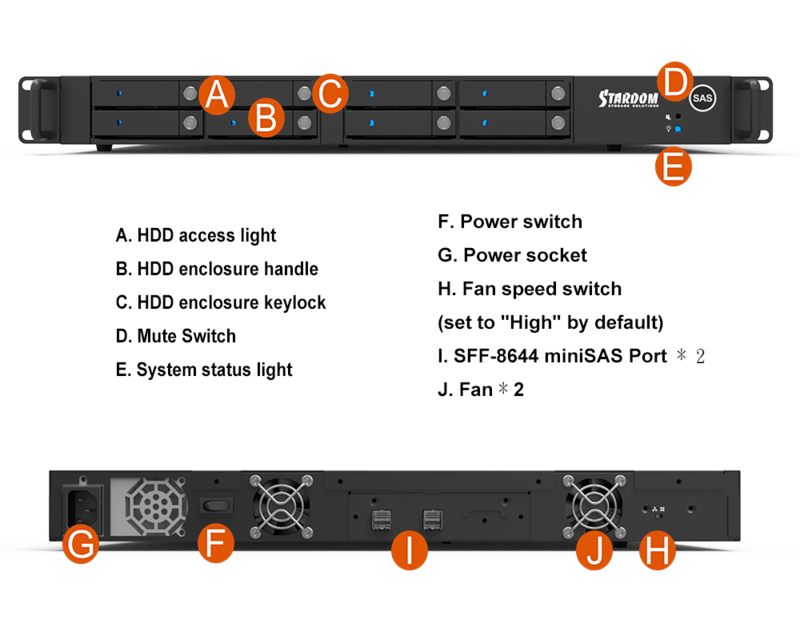 While the system temperature rises up to 55 degree-C (131 degree-F), MCU will bump up the fans with full speed; and once system temperature goes down to 50 degree-C (122 degree-F), you could manually adjust fan switch on the rear, MCU would reduce the fan speed down to a half speed for a better green user environment from a less fan noise and lower power consumption. In addition, if the fan fails or the device temperature is too high, the buzzer will beep and let the user know that the device has failed. The user can turn off or turn on the buzzer through the mute adjustment switch on the back of the back panel. 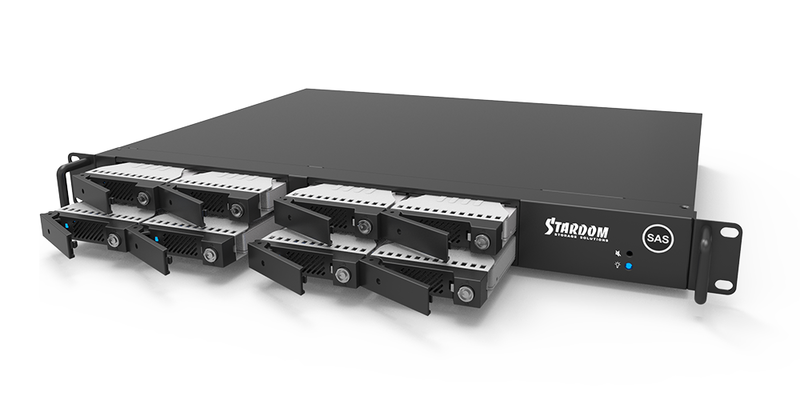 The two iron die-casting rackmount ears are strong enough for you to move DT8M-U6 easily among your system racks in your server room! DT8M-U6's solid chassis is made by a thickness aluminum-alloy plate. 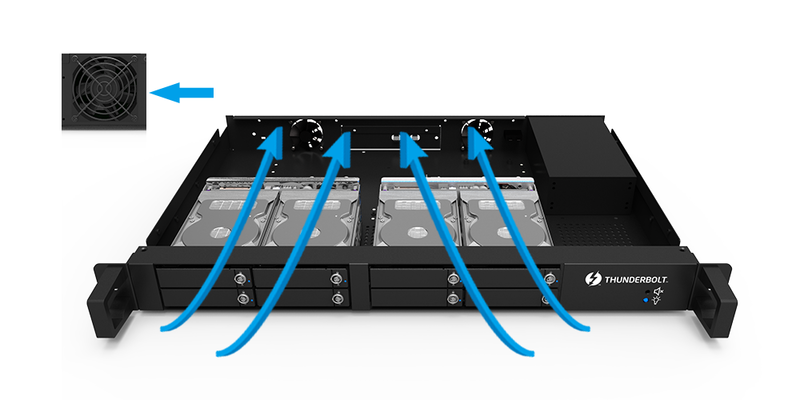 And its aluminum housing and the two 4 cm FANs (with safe FAN GUARDs) really help an efficient heat dissipation for your long time use. 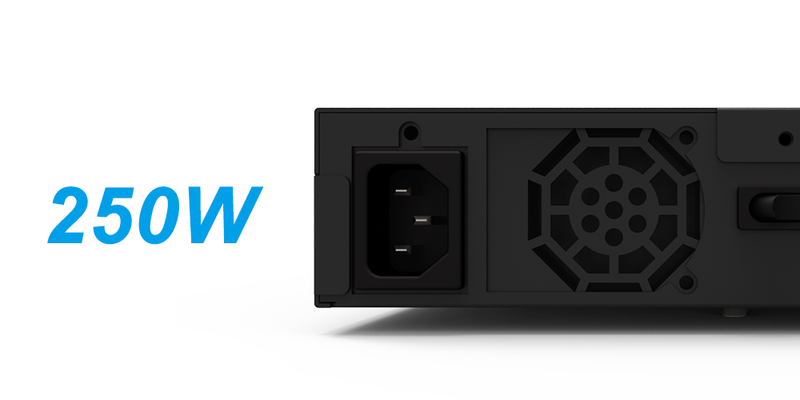 DT8M-U6 uses conform with safety regulation certified 250W power supply unit which provides a stable and high efficient power output and definitely satisfies the big power consumption from all 8 HDDs. 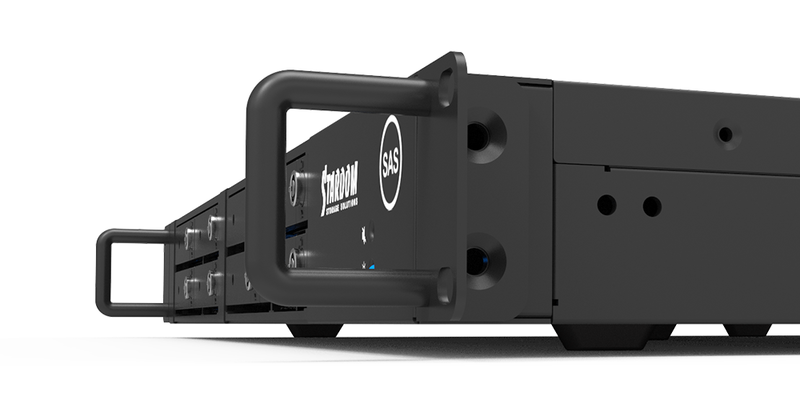 Even though it's a standard 1U-19" rackmount chassis size, DT8M-U6 still has a fashion ID to match your Mac or PC while standing beside it. It's well protected under its aluminum chassis which also helps dissipating heat too! DT8M-U6 is designed for you to pile them up together firmly. It occupies only for two A4 paper size at your desk if you pile them up together. 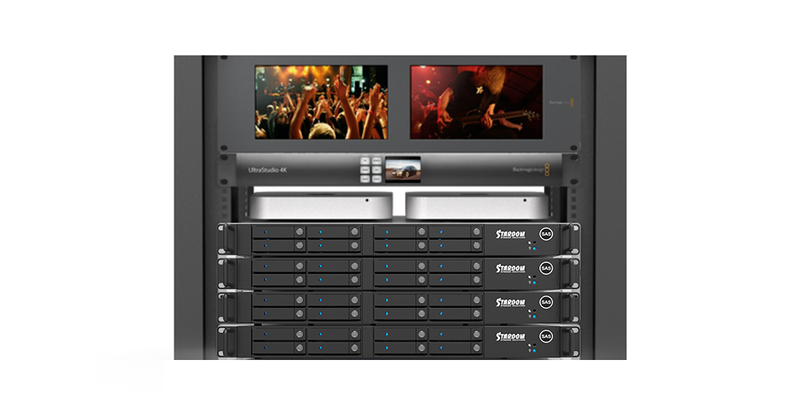 And of course, you could mount DT8M-U6 at your server rack too! 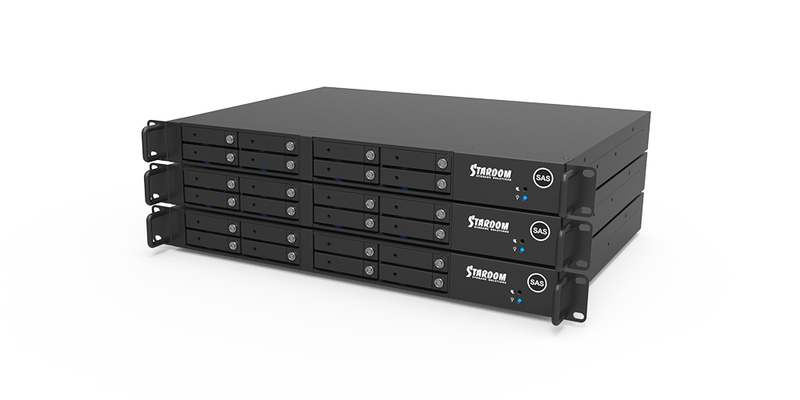 You could easily install your new DT8M-U6 into your standard 1U-19" server rack for both of server and workstation applications. 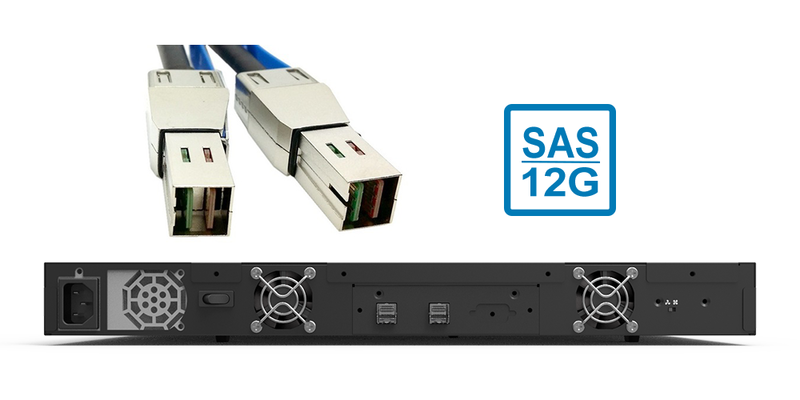 Our DT8M-U6's 12Gb/s data transfer rate and JBOD features fits most of your old SAS RAID controller adapter from your former Mac Pro and Windows PC. 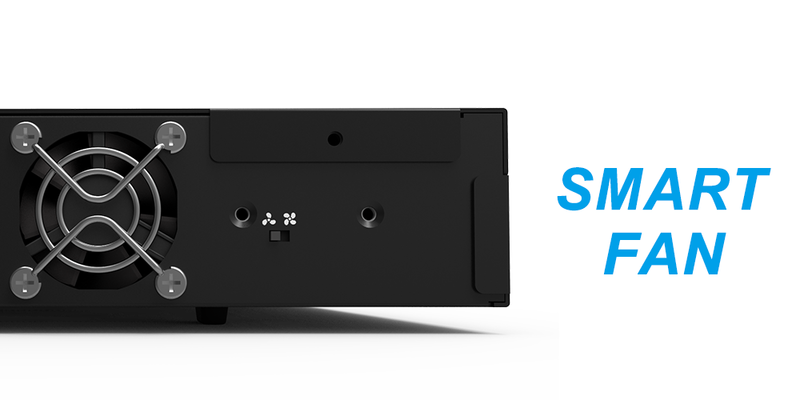 And also, you could use our SA2TB3 Docking or AR0080-TB3 to connect DT8M-U6 to your Mac which supports Thunderbolt 3 interface. 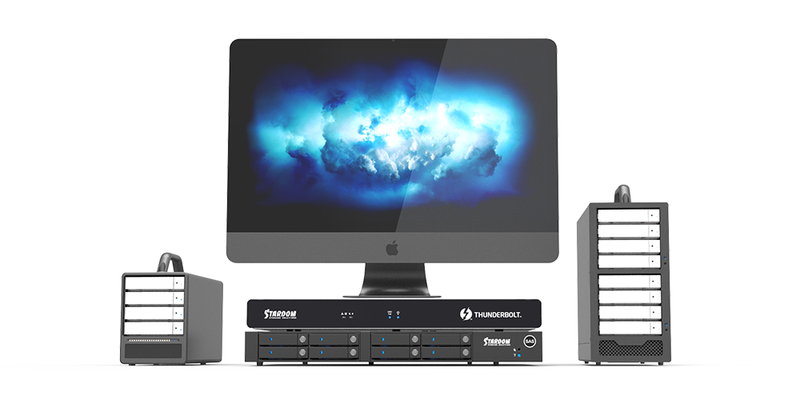 Thru one new Stardom SA2TB3 docking, you could easily connect DT8M-U6 with a total 8 HDDs to your new Mac Thunderbolt. 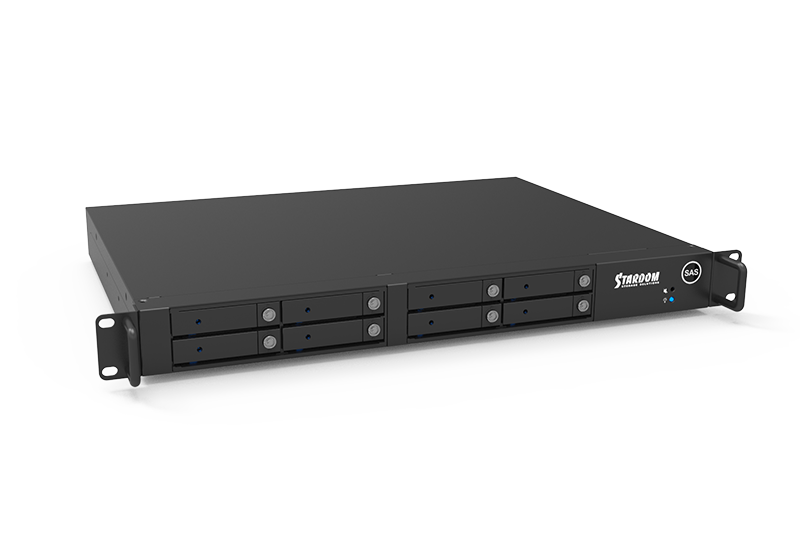 This solution also gives you an excellent data transfer rate up to 1500MB/s with its RAID 5 feature which lets you not only enjoy watching your 4K video with no missing frames but also get a perfect data protection for all your data in 8 HDDs.